HTML5 eLearning authoring tools have become an industry standard nowadays. That being said, it is essential for all eLearning professionals to be aware of the available options in the eLearning authoring tool market. In this article, I’ll provide you with the ultimate list of HTML5 eLearning authoring tools the eLearning industry has to offer. There isn't any doubt that the eLearning industry is evolving. Curriculum is becoming more interactive and, at the same time, an increasing number of online learners are using mobile devices to access eLearning courses. As a consequence, the way that eLearning Professionals design, create and deliver eLearning courses is rapidly changing, or at least it should be. Nowadays, HTML5 eLearning authoring tools are being used by eLearning professionals from all around the globe, thanks to their versatility and variety of features. The primary reason for the shift to HTML5 eLearning authoring tools is the massive usage of mobile devices, such as smartphones and tablets (namely the iPad and iPhone) in almost all aspects of our everyday lives. In addition, Bring Your Own Device (BYOD) support is on the rise. In 2013, Cisco’s BYOD Insights report revealed that 9 in 10 Americans already use their smartphones for work purposes . Historically, eLearning courses have been designed using Adobe Flash, which has allowed eLearning Professionals to deliver content that was more immersive and effective. However, many mobile devices do not support Adobe Flash, creating a major problem for those who have been relying upon Adobe Flash to produce eLearning courses. HTML5, on the other hand, is supported on a wide range of platforms and browsers. As such, users are able to take their eLearning courses with them, rather than having to be tied to a computer. It also allows for offline storage and data management, even when the user is not connected to the Internet. In addition, HTML5 eLearning courses actually use less CPU space and battery power, which means that they can typically run faster and more efficiently than Flash-based courses. Need help finding the right HTML5 eLearning Authoring Tools? We’ve got you covered. Here is a comprehensive list of the best HTML5 eLearning Authoring Tools in the eLearning industry. One of the most well-respected HTML5 eLearning authoring tools with lots of great features including Adobe Captivate Draft, as well as a free trial. This innovative tool enables you to convert your ideas into storyboards, by adding content, question slides, branching scenarios and other interactive elements, and directly import them into Adobe Captivate (2017 Release). It also allows for the creation of simple ideas via gesture control, as well as the ability to embed web pages as objects into your storyboard. The UI of Adobe Captivate (2017 Release) makes eLearning authoring a breeze. Whether you are a Subject Matter Expert with no knowledge of eLearning authoring tools or an experienced user, Adobe Captivate (2017 Release) is the ideal go-to solution. A library that boasts of more than 75,000 free eLearning assets, including interactions, themes, templates, people cutouts, royalty-free images, and much more. Increase the effectiveness of your eLearning content by downloading the perfect asset directy into Adobe Captivate (2017 Release), customize it, if needed, and increase the effectiveness of your eLearning course. Adobe Stock comes for free with every Adobe Captivate (2017 Release) subscription. The standard option is Subscription and runs at $29.99 per month with an annual commitment, while the second pricing option is Full License at $1,099 per licence. Last, there is a Licence Upgrade option for users of previous Adobe Captivate versions who can upgrade to the latest version for a price of $449. Elucidat is one of the most popular HTML5 eLearning Authoring Tools. It has been used for the design of eLearning courses for numerous industries such as sales, customer service, compliance, soft skills, leadership and scenario training. Elucidat allows eLearning course designers to create eLearning courses that comply with Section 508 requirements. It also ensures that your content can be accessed from all devices, portable or not. Elucidat has great analytics features that enable eLearning course designers to see how their online learners progress with their online training. It also offers great customization potential on every aspect of eLearning course design. Elucidat boasts a massive 25.000 free eLearning image library. It also offers the chance for information localization as well as the ability to futureproof all eLearning courses so that they can function on any upcoming mobile or desktop device. For specific pricing options contact them directly through their website. Optimization and mobile responsiveness for playback on all devices, ease of use along with a good amount of advanced features. What’s more, Articulate Storyline 360 boasts fast simulation building tools which make it one of the most reliable HTML5 eLearning authoring tools. Articulate Storyline 360’s Content Library offers 100.000 combinations of photographic and illustrated characters, as well as 1.500.000 unique photos, illustrations, icons and videos. eLearning authoring does not have any language limitations thanks to Articulate Storyline 360’s localized interface that’s translated into English, Chinese, French, German, and Spanish. You can also import content from a wide variety of media such as MS Powerpoint, Quizmaker, Excel Spreadsheets or text files. Pricing plans cover all the range of Articulate 360 tools, not just Storyline. There are 2 categories, namely Business and Education. Pricing plans start from $299 per year for each user in the education category and vary according to the number of users. Gomo Learning has come up with a Learning Suite that comprises indispensable features you need to create, organize and deploy an eLearning course. Gomo Learning’s HTML5 eLearning authoring tool helps eLearning content developers craft compelling and interactive eLearning experiences. Gomo Learning’s HTML5 eLearning authoring tool offers great variety in media assets that can be included in an eLearning course. Its responsive design ensures proper playback on any device. Web content from numerous well-known sources can also be imported such as Youtube, Google Maps or even Twitter Feeds. Gomo Learning does not require programming skills for eLearning content to be developed. Its simple drag-and-drop interface provides an easy way to author eLearning content. Also, with Gomo’s preconfigured screen templates all you need to do is provide the content. The authoring tool takes complete care of the layout. Depending on the size of the project and the pricing limitations users can choose between the Personal, Small Team or Enterprise package. The Personal package is available at $89 per month or $890 per year, while the Small Team plan can be purchased at $249 per month or $2490 per year. The Enterprise plan covers all needs of large organizations and their partner network. For more information on pricing options of the Enterprise plan contact the company directly. ITyStudio is quite impressive. It enables the creation of games with interactive maps and behavioral simulations. It also applies to various audiences such as instructional designers, eLearning content developers or even multimedia editors. Free 15 day trial available. Great number of settings to choose from including Retail, Medicine, Public Buildings and Works. ITyStudio showcases many characters you can include in your games such as farmer, estate agent, doctor, salesman, marketing professional. With ITyStudio you don’t have to feel restricted as to what type of eLearning content you will use. It is compatible with all major eLearning authoring tools such as Lectora, Storyline and Composica. You can also embed various media like film sequences or product images and quizzes. The ITyStudio pricing plan costs $35 per month or $350 per year with unlimited number of scenes as well as SCORM and HTML exports. What’s more, the ITyStudio full pack runs at $1790 per year and offers additional classroom training and 5 hours of instructional hotline. However, a 1 year minimum subscription rule applies for both plans. Included in the Top 10 eLearning Content Development Companies for 2016 as seen on eLearning Industry, Obsidian Learning came up with a highly effective HTML5 eLearning authoring tool. Obsidian Black allows for automatic syncing of voices with your text, images or animations. This gives eLearning content developers the chance to produce quality videos or animations that engage online learners. In addition, Obsidian Black complies with all major format standards, such as SCORM 1.2, 2004 and Tin Can API. As result, it is compatible with most well-known Learning Management Systems. Obsidian Black allows eLearning project members as well as clients to review or leave comments on courses. This feature significantly enhances the quality of the eLearning projects produced and contributes to the creation of better eLearning courses in general. The Personal pricing plan offers unlimited projects and 1 GB storage and costs $45 per month billed yearly or $50 if charged on a monthly basis. The second plan is called Personal Pro and features 4 GBs of storage space as well as export to SCORM 1.2, 2004 and Tin Can API. The Personal Pro runs at $70 per month if you opt for the annual billing or $80 in monthly billing. There is also an Enterprise plan available for which you have to contact the company directly. When you come across an HTML5 eLearning authoring tool that’s trusted by companies such as Johnson & Johnson, Pearson, Barnes & Noble and BMW you know you’re up to something good. Excellent characters and backgrounds, branded scenarios, tracking and reporting features, as well as gamification features to engage your online learners. Branchtrack’s responsive design allows your branded scenarios to play perfectly on both desktop and mobile devices. It also lets you modify the visuals to achieve unique creations. A substantial character and background library can accommodate all your needs. What’s more, characters can strike different poses and facial expressions to show different emotions. You can add voiceovers that apply to a range of industries, from telemarketing and sales all the way to language training. Engaging gamification features involve your learners in the learning process even more and challenge them to compete for awards and badges. Branchtrack’s tracking features let you track your online learners’ progress as well as have access to player data. The most affordable pricing option is the Professional plan, which is available at $242 per month. For more increased needs there are 2 other plans. The Enteprise plan can be purchased for $300 per month and the Interactive Video plan will cost you $575 per month. Easygenerator is an HTML5 eLearning authoring tool that goes beyond mere eLearning course creation. It gives users the chance to even apply their own instructional designs in the course. Easygenerator does not require any coding background to be used effectively. The easy-to-use interface enables eLearning content developers to jump right into the process of eLearning course design. Its Next-Gen Authoring features eliminate the need for the user to focus on such issues as optimization for different devices or result tracking. SCORM and Tin Can compliance guarantees that Easygenerator is compatible with the great majority of well-known Learning Management Systems. What’s more, Easygenerator is cloud-based which speaks volumes about its functionality, easy user access and data safety and security. The basic pricing plan will cost you $49 per month and allows you to create up to 100 courses. For unlimited courses and great customization options you are leaning towards the Academy plan, which you can buy for $69 per month. Adapt is an open source HTML5 eLearning authoring tool that is responsive and has great playback features across all devices. It also has an intuitive interface, SCORM compatibility and it is easy to use with well-known Learning Management Systems. What’s great about it is that it can be used by both developers as well as people with no programming experience. Adapt has meticulous guidelines on all aspects of the authoring tool. From installation and eLearning course creation instructions for end users all the way to platform-related information on backend servers and development plug-ins for developers. As an open source HTML5 eLearning authoring tool, Adapt showcases an extensive developer section. This section includes sub-sections such as Code Review, Project Management and Code Hosting. The Code Hosting section is a particularly useful one as it has repositories with tools that help you host, version and release code. Adapt does not offer premium pricing plans. However, it does give you the chance to share plug-ins you created, or contribute to the source code. If you’re looking for a tool to help you create interactive animated content, then your search has reached an end right here. Adobe Animate CC is one of the best HTML5 eLearning authoring tools for this purpose, boasting some of the most innovative features in the market. Vector art brushes help you easily produce, edit and change resolutions without distortions to any of your creations. Audio syncing is easy to use without any need for programming knowledge. Users have a great variety of photos, illustrations and vector graphics to choose from. Adobe Stock, with more than 60 million images, is built right into Animate CC. You can also create animations and then import them to static images, making unique creations that match your project’s needs. Adobe Animate CC can be used together with a plethora of other applications such as HTML5 Canvas, WebGL, Flash, SWF, as well as other custom platforms. Adobe Animate CC features 1 pricing plan with 3 different billing plans. The annual plan runs at $19.99 per month if you pay on a monthly basis. If you prepay for the whole annual plan you will be charged with 239,88 per year. The last option is the monthly plan which runs at $29.99. HTML5 eLearning authoring tools are a standard in the eLearning authoring tool market nowadays. Agylia has well realized that and they’ve come up with the Agylia eLearning Authoring Module, a feature rich, SCORM 1.2 and Tin Can API compliant eLearning authoring tool. Company clients such as Microsoft and Deloitte can vouch for its efficacy. eLearning content developers do not have to be constantly online with Agylia. They can work independently, reconnect and update project developments. Agylia also enables eLearning content developers to craft engaging content in the form of games and engaging interactions like image pop-ups and walkthroughs. Reviewing and quality assurance can be a painful process in absence of the right tools. Agylia offers built-in version tracking and reviewing features that make quality assurance significantly easier. Agylia eLearning Authoring Module utilizes a per license pricing model. For further information on pricing options contact them directly through their website. Area9 Learning Platform is a cloud-based HTML5 eLearning authoring tool and Learning Management System as well as a reporting tool. eLearning content developers can upload numerous types of content to include text, animation, video, Powerpoint, 3D models and simulations. Area9 Learning Platform is compatible with performance support tools. It also features variety in question types with 16 different types. Area9 Learning Platform enables users to make real time updates that are pushed to old or new users. The “Challenge Button” is an innovative function that allows online learners to provide eLearning content developers with feedback on question accuracy. Additionally, the “Feedback Button” enables online learners to evaluate content quality and notify eLearning content developers. For further information on specific pricing options contact them directly through their website. Highly effective HTML5 eLearning authoring tool that enables the creation of mobile responsive courses, as well as the integration with Salesforce and Outlook. Brainshark provides an easy way to the transformation of PDFs and Powerpoint slides into engaging and interactive content. Sharing is also made extremely easy by use of simple web links that can be uploaded to any third-party platform you desire, be it the LMS, a website or Youtube. Much like Brainshark’s motto “Power your content. Power your sales” suggests, Brainshark is an HTML5 eLearning authoring tool that mostly targets the sales sector. Also, it is cloud-based and does not require any installations. For specific information on pricing options contact them directly through their website. Camtasia Studio 8 is considered one of the most effective HTML5 eLearning authoring tools in the eLearning industry. It boasts powerful editing features, and its content creation potential is pretty much limitless. Available for Mac and Windows users in both English and German. Camtasia Studio 8 enables you to edit content with simple drag-and-drops right in the preview window. It also promises fast rendering times and boosted stability due to its 64-bit processor. By choosing Camtasia Studio 8 you will get access to a wide variety of eye-capturing animated backgrounds, ready to use icons, as well as motion graphics that can be integrated into any part of your eLearning courses. The list is immensely long. Screen recorder, media imports of up to 4K resolution, multi-track timeline, annotation tool, transition effects, animations, voice narration, audio and visual effects are some indicative features that comprise the list of additional features. Camtasia Studio 8 can be purchased at $199. There are also education pricing and government pricing packages available. CLARITY is a rapid-to-serious visual authoring tool that is based in the cloud. It has great gamification features and dynamically adaptive content. CLARITY’s AI Tutoring Engine enables online facilitators to track online learner performance, update the Learner Dynamic profile and provide the learner with effective and customized eLearning experiences. Each online learner’s profile provides online facilitators with abundant information on various online learner profile aspects. Online facilitators can use such data to improve the eLearning experience even further. CLARITY has a starting price of $10 per month for every user. For further information on specific pricing options contact them directly through their website. Create, collaborate, publish. A three-word motto that fully demonstrates Composica’s mission in the eLearning industry. Composica offers some great additions to the features other HTML5 eLearning authoring tools have. One is some excellent advanced feedback functions including animated corrections. You can also embed blogs right into your eLearning course as well as enable online learners to leave comments on your content. You can also export course text and have it translated to virtually any language using the XLIFF standard. Version control allows you to go back to a previous version of your eLearning content or restore sections you may have deleted. The history section allows you to track eLearning content easily and recover what you may need. Reviewers have their very own dashboard to work with and organize their tasks. Communication between project members is also made easy by means of community dashboards that allow people working on a project to communicate. One-on-one or group chats is an additional communication tool if you opt for Composica. You can purchase Composica for $99 per month billed annually or for $129 on a month-to-month basis. Composica also offers educational discounts. Great accessibility, customization and integration features along with the ability to make Section 508 compliant eLearning courses make CourseArc a strong player in the HTML5 eLearning authoring tools market. With CourseArc you don’t have to worry about re-designing your eLearning course for playback on various devices. Responsive design ensures you create your eLearning content once and then it can be effortlessly played on any device. If you need to create courses that are Section 508 compliant, CourseArc has you covered. Template design can be branded to your company and you can include all types of interactive content including Youtube videos, drag-and-drop exercises or online quizzes. CourseArc uses LTI and guarantees compatibility with all major Learning Management Systems. Collaboration towards eLearning content development becomes a breeze with the authoring tool’s collaborative features. More than one editors can work on a course at the same time, leaving comments and assigning tasks to their fellow team members. The Individual pricing plan is purchased for the price of $150 per month or $1500 per year. The second plan is called Team and costs $500 per month or $4500 per year. The Professional plan is your third option and runs at a starting price of $7500 per year. Last but not least, if you want an Enterprise plan it will go up to $15,000. HTML5 eLearning authoring tools do not always have to have a fancy interface or overly complicated features. EAD Builder can fulfill all your basic eLearning authoring needs. No compromise in variety here. Scenario builder, characters, objects and environments, all from the comfort of an easy-to-use interface. EAD Builder allows users to upload their own images and make them a part of any scene. Users can use music, sounds and effects to make the scenario even more immersive for the online learners. If you purchase the premium version you will be able to export all your eLearning content in SCORM format and link it with your Learning Management System. You can choose between 3 different plans depending on whether you need features such as collaborative editing and Video Upload. For specific pricing options contact them directly through their website. eLAT demonstrates great potential in the tough market of HTML5 eLearning authoring tools. Features such as the Live Preview, its responsive design, future proofing, auto-saving and theme library guarantee great functionality and content versatility. The Live Preview is an invaluable feature as it lets you see how your content plays out in multiple device types. What’s more, you don’t have to stop the process of designing your eLearning content to go to preview your materials. Content created using eLAT plays on any device including phones, tablets and desktop computers. Technology evolves and new devices come out all the time. eLAT provides future proofing to ensure that you will only have to create your content once and it will play perfectly on any device, current or future. Auto-saving eliminates the risk of losing important project progress you’ve made because you neglected to save in time. The Theme Library enables eLearning content developers to customize templates and match them to the company’s style and colors. The Single User Pro pricing plan is offered at $24,99 per month for unlimited projects and allows you to use all eLAT features as well as free upgrades and updates. The only drawback is that it’s limited to one user only. If you require 4 users per month and 10 GBs of storage then you should opt for the Small Team Pro plan which can be purchased at $84,99 per month. The Enterprise plan features support on a more large scale. Contact the company directly for further information regarding the Enterprise plan. Responsive cloud based HTML5 eLearning authoring tool that allows all members of an eLearning team to flawlessly work together. From eLearning content developers and instructional designers all the way to reviewers, eNet Author comes packed with all the tools different team members need to collaborate effectively. The Library Of Smart Objects has multimedia and interactive resources in abundance. A basic pack of course templates is also featured here to get you started on your eLearning project . However, you can always create your own templates for an entirely unique experience. eNet Author allows developers to see the website’s code, use custom scripts and work on content functions. It also showcases smart eLearning project management tools that enable eLearning team members to arrange meetings, assign tasks and communicate with fellow team members on project progress. The first pricing package is named Author and targets eLearning content developers. It can be purchased at $2,200 per year. There is also an additional premium package called Developer that allows Developers to customize smart library objects or create and customize containers. The main reason why Enlightenment was developed was to give online facilitators and online learners a much more interactive and engaging experience. Enlightenment can function on pretty much any operating system, including MacOS, Ubuntu, Windows and Android to name some. It is affordable and utilizes animations, motion videos, graphics, sound and many other features that significantly enhance learning. It also enables development of problem-based learning and work-based learning as well as analytical and critical thinking skills. Starting price is at $25. For further information on specific pricing options contact them directly through their website. Pearson and Randstad use Evolve to design eLearning content for their online training needs, so this HTML5 eLearning authoring tool comes highly recommended. Evolve utilizes presentation interactions that cater to all learning styles. As a result interactions such as videos, flip cards, carousels, flow charts and sliders are integral features of eLearning course design with Evolve. Variety in Question Interactions guarantees that testing becomes something more than the mind-numbing process some learners are familiar with. Evolve’s Theme Editor allows you to modify the look of all the interactions of a page, a menu or a whole course. You can also alter various parameters of the built-in themes for even greater customization. Branding your course and giving it a unique look that matches your company is essential. Evolve allows you to do just that. Brand your course in terms of the logo, brand colors and various other aspects. Starting price is at $30 per month. For further information on specific pricing options contact them directly through their website. HTML5 eLearning authoring tools are not hard to find nowadays. What’s inarguably hard to find however, is HTML5 eLearning authoring tools that support all major formats, have great version tracking and integration features, and boast practical collaborative authoring functions. All eLearning content developers will confirm what a great convenience it is for an authoring tool to be compatible with all well-known formats. Well, with Exact Learning Packager you don’t need to worry about such issues. SCORM 1.2 and SCORM 2004, AICC and Tin Can API, HTML5, XML, PDF, MS Word and Powerpoint as well as PDF to name some. Working on different versions of the same document can be a troublesome process. Version tracking allows you to trace previous versions of a document as well as compare different versions to see what changes have been made. Define who has access to what, leave comments on the work of fellow team members, assign tasks and share files to better collaborate with other members in your team using Exact Learning Packager. It can also be integrated with Microsoft Office 365 which enables users to create and edit documents effortlessly. If you’re looking for a game-based authoring tool that enables online learners to learn and not even realize it, then you’re looking at the right HTML5 eLearning authoring tool. If you choose Genie for your gamified eLearning authoring needs you will only be concerned with the content. Genie’s responsive templates and additional features ensure your content will be optimized for playback on any device. Also, you can export your content to multiple platforms that are compatible with Genie. This is one of the most solid open source HTML 5 eLearning authoring tools. What’s more, it’s also free to use, has great features and available as a Moodle and WordPress plugin and a Drupal module. Course presentations, arithmetic quizzes, documentation tools, charts, collages, interactive videos, timelines, Twitter user feeds as well as dialog cards comprise some of the types of content H5P supports for eLearning course design. H5P also gives detailed instructions on how to develop new content types. H5P’s responsive design allows for playback on any device, mobile or not. H5P enables eLearning content developers to create quality eLearning content ranging from videos and presentations all the way to advertisements. H5P is a free HTML5 eLearning authoring tool. No pricing plans apply. Responsive design in a user-friendly, interactive HTML5 eLearning authoring tool that offers fast processing times and a well laid-out interface among other features. IMC Content Studio, with its Ribbon toolbar, makes the process of creating eLearning content very easy. Basic functions are accessed in a faster way for ease of use. You can also import an array of content types as well as utilize the text-to-speech tool to create audios from existing texts. Variety in question types and testing situations as well as the ability for the eLearning content developer to define the learning path and make all necessary adjustments or even skip whole chapters if needed. Instancy is an HTML5 eLearning authoring tool that comprises great features such as the Learning Module Editor, a Microsoft Powerpoint and Word Converter, an Assessment and Survey Editor and a Knowledge Article Editor. The Learning Module Editor allows eLearning content developers to create engaging eLearning content that includes text, video, graphics, audio and animation. You can also preview your content in HTML5. The MS Powerpoint Converter lets you transform your Powerpoint slides into quality eLearning content by enriching them with interactions, multimedia elements or quizzes. The MS Word Converter is a feature that allows instructional designers to import existing storyboard documents into the Learning Module Editor and automate the process of eLearning content creation. Instancy’s Assessment and Survey Editor is a feature that allows eLearning content developers to create assessments and quizzes with great variety in question types such as true or false, single correct, multiple choice, fill-in-the blanks, essay, drag and drop, and single or multiple matrix questions. The Knowledge Article Editor is a tool that enables eLearning content developers to add images, screenshots, videos, or hyperlinks to related knowledge articles. Quizzes are a central part of all eLearning experiences. Most HMTL5 eLearning authoring tools provide the option for quiz making within the eLearning authoring platform. iSpring has gone well beyond that and designed an independent platform just for providing unique, mobile responsive quizzes. Endorsed by companies such as IBM, Microsoft and AT&T. The interface is pretty straightforward and you can even import content from other quizzes or Excel. iSpring QuizMaker comes with a well-sized library of themes, colors and backgrounds, fonts, font colors and sizes as well as the ability to customize your player. QuizMaker is compatible with any SCORM, AICC and TinCan compliant Learning Management Systems. iSpring QuizMaker features 14 different type of questions, a combination of graded and survey questions in quizzes, along with the ability to import various types of media in a question. You can also set formulas and images as an answer or record audio for questions and feedback. HTML5, Blackboard and export to MS Word output features are available. The only pricing option runs at $370 for a lifetime license. However, discounts are made if you purchase more than one licenses. iSpring Suite is an authoring toolkit for PowerPoint, so you won’t need any training to get started. A brilliant HTML5 eLearning authoring tool for Powerpoint allowing you to convert simple presentations and slides into full-fledged eLearning courses. iSpring offers a Learning Management System as well. iSpring Suite offers advanced video editing capabilities. You can create video lectures, software tutorials, and screencasts. iSpring’s Video Studio eliminates the need for outside applications as it allows mixing, editing and synchronizing video with easy drag-and-drop interface. You can create courses that will adapt themselves to the screen size of the viewer, so your learners will be able to access them from any device. You need to create a course only once and it will play smoothly on various learner’s devices. You have a live preview of the course on different screen sizes even before publishing. With iSpring Suite, you can take your existing Powerpoint content and transform it into beautiful eLearning courses. iSpring Suite enables the creation of assessments, dialog simulations and eLearning interactions that are out of the ordinary, including features such as branching, drag-and-drops, videos and flexible scoring. What’s more, iSpring’s Content Library offers great abundance in media as well as course templates, themes, photographic characters and backgrounds. iSpring Suite is available by subscription pricing plan at $970 / year and include all upgrades, content library, and premium support. You can buy the lifetime license for the full iSpring Suite for $770. Communication skills are fundamental in almost every industry. However, there are not a lot of HTML5 eLearning authoring tools that help people train communication skills. iSpring TalkMaster was designed to fill that gap. Customization options are pretty much limitless. Plethora of character photos for various industries, ability for characters to demonstrate different emotions according to the user’s replies, as well as good variety in scene locations to get people in the right context. You don’t have to limit yourself to TalkMaster’s default audio narrations. TalkMaster allows you to import your own pre-recorded narrations. It also features an audio editor that allows you to boost your imports’ or creations’ quality or edit parts as you see fit. As with all iSpring products the TalkMaster is available in the form of a lifetime license. The only pricing plan can be purchased at $470, but if you buy more than one licenses you get a reduced price. This HTML5 eLearning authoring tool provides a cloud-based way to author eLearning content that does not have device limitations due to its responsive design. Kitaboo offers immediate access to the authoring tool. Mobile responsiveness guarantees that your content will function immaculately on any device. Additionally, you can use Kitaboo together with many well-known LMSs. Great interactive features that allow you to embed interactive widgets for quizzes, videos or audios using simple drag and drop movements. Starting price is at $15,000. For specific information on pricing options contact them directly through their website. With expertise in industries such as Hospitality, Manufacturing and Healthcare, Knowledge Anywhere Course Builder can help you achieve rapid course publishing, cloud based collaboration, and simple yet flexible course authoring with its extensive range of features. This HTML5 eLearning authoring tool allows you to create SCORM 1.2 and Tin Can API 1.0 compliant content that functions on any device. Knowledge Anywhere Course Builder is based in the cloud, which means that all members of an eLearning project can effortlessly and efficiently collaborate to uphold the highest standards of content quality. Whether you’re looking to use ready-made course templates or create your own, Knowledge Anywhere Course Builder can help you rise to the task. The Express pricing package requires a payment of $799 each month, whereas the Professional plan can be purchased at $1,599 per month. The main differences between the 2 plans have to do with the number of users and administrators that will be using the authoring tool. For more advanced needs there is also an Enterprise plan. If you are interested in the Enterprise plan you will have to contact them for further information. P&G, IBM, Macy’s, BMW and FedEx use Lectora Inspire for their eLearning course development needs. Consequently, one can understand that this HTML5 eLearning authoring tool comes highly recommended. Editing options are abundant, including features such as rotating and flipping, image cropping, as well as an innovative formatting tool called Hover Text that makes formatting much easier. You can also create or customize various objects such as buttons or callouts or add shadow and reflection effects to images or shapes. Lectora Inspire can be integrated with Camtasia Studio 9 and Snagit 13 for all your video recording and image editing needs. With these integrations eLearning authoring is taken to a whole different level. Lectora Online showcases all the great features of Lectora Desktop, eliminating the need for time-consuming installations because it’s cloud-based. Also, if you’re looking for an HTML5 eLearning authoring tool that supports Section 508 compliance then your search is over here. One of the reasons that sets both Lectora Desktop and Lectora Online apart from the bunch is their ability to help you create Section 508 and WCAG compliant courses. Some of the features include visible focus indicators, language declaration for the title and text, reading order control, closed caption ability for audio and video, as well as scope attribute for table headers. What’s more, closed captioning is also available in the formats specific to Section 508 and WCAG, namely WebVTT, SRT, and XML. With Lectora Online you can specify if the online learner will be notified of the results or not. The Results Designer allows you to determine the way which results will be presented including what data will be available and in what order. You can even accompany results text with images. Text Block Styling tools include dashed lines, dotted line borders and shadow effects. Starting price is at $159 per month. For further information on specific pricing options contact them directly through their website. Litmos Author showcases some great features that all HTML5 eLearning authoring tools should have. Asset management, collaborative course development and real-time content reviewing set Litmos Author apart from the bunch. Plus, you don’t have to worry about losing your content because it’s all in the cloud. Media assets can be uploaded on Litmos Author and be optimized for playback on any device. You can also upload your own Powerpoint presentations, convert them and incorporate them as eLearning content. Best of all, there are no content storage limitations. Litmos Author comes packed with 4,000 stock photos to get you started on your eLearning designs. Litmos Author makes it easy for eLearning content developers to collaborate on any project due to its great collaboration features such as online chatting. It also gives users tremendous customization potential. You can even upload your own custom style players and page templates so that you make sure your eLearning course looks like no other. This feature eliminates the need for all the hussle the reviewing stage brings. It empowers reviewers and allows them to organize the reviewing process in a more accurate way. Live Content Studio is an HTML 5 eLearning authoring tool that’s easy to use, showcases great reporting potential and boasts features that go beyond conventional eLearning. An easy-to-use and intuitive interface guarantees significantly reduced time for eLearning course design. Live Content Studio’s workflow capture tools are highly automated. No lengthy graphics are required to explain the authoring tool’s various functions. Click by click reporting allows online facilitators to track learner progress, detect knowledge gaps and adapt online training. User Score Sheets are customizable and reports can also be customized on many different levels. Live Content Studio enables eLearning content developers to create live scenario assessments for customer service and call center teams as well as quality eLearning materials that engage online learners. Starting price isat $850. For further information on specific pricing options contact them directly through their website. Lumesse CourseBuilder is an HTML5 eLearning authoring tool that combines all the advantages of an SaaS authoring tool and a desktop application. The WYSIWYG skin editor, the page editor and the flow view enable eLearning content developers to craft quality eLearning content by use of simple drag-and-drops. Lumesse CourseBuilder boasts great features when it comes to reviewing. Automatic documentation of review processes, easy tracking and feedback from both internal and external reviewers are possible with Lumesse CourseBuilder. The media repository is accessible by all eLearning content developers working on an eLearning course. They can share or reuse media as they see fit. They can also collaborate using Lumesse CourseBuilder’s functional features. The Coursebuilder community allows Lumesse Coursebuilder users to communicate and exchange tips or best practices. Starting price is at$3500. For further information on specific pricing options contact them directly through their website. Learnetic has come up with a complete solution for both the design and deployment needs of eLearning courses, with an HTML5 eLearning authoring tool and a Learning Management System. Learnetic knows that although the Internet is a highly used learning medium nowadays, not all people have access 24/7. mAuthor comes with a mobile application that gives learners the chance to access the content offline or download the content in their computers. More importantly, online learners can complete activities offline and their progress is synchronized once they are back online. mAuthor’s eContent Logical Structure is a feature that organizes eLearning content and data in a functional way and stores them in open XML formats. They can then be reproduced seamlessly on all devices. mAuthor supports SCORM 1.2, SCORM 2004 and Tin Can API. As a result, it is compatible with all reputable Learning Management Systems that support these specifications. Additionally, data about online learner progress are collected by mAuthor which are then used to provide more customized eLearning experiences. Starting price is at $1000. For further information on specific pricing options contact them directly through their website. Netex Learning Cloud made it to The Ultimate List Of HTML5 eLearning Authoring Tools with good reason. It comprises great features, a responsive design and utilizes a template-based approach that makes eLearning content development easy. Although Netex Learning Cloud does provide you with many great features, what’s best about it is that it becomes even better when you integrate third-party apps. The eLearning authoring tool comes equipped with a few third-party apps but you can always add more to that list from various content catalogues or video channels. No need to waste time on how to structure your content as Netex Learning Cloud takes care of it for you. You only need to provide the content and the platform will transform it into well-structured eLearning courses. Raptivity is available for both Mac and Windows users, includes 190+ customizable interactions and can be used together with all the big players in the eLearning authoring tool market. Raptivity Essential includes 30 interactions whereas Raptivity Suite includes 102 interactions, so you can choose the one with the features that fit you best. Raptivity offers Unicode support for various languages to include English, Spanish, French, Arabic and Turkish to name some. In addition, it can be used in combination with well-known authoring tools such as Articulate Storyline and Adobe Captivate. Full control and customization over various object settings, questions, outputs, fonts and images. Raptivity can be connected with many reputable Learning Management Systems such as Blackboard and Moodle. There are 2 licenses available, the lifetime license and the annual license. The regular annual license is available only with Raptivity Suite and costs $300, whereas the license for educational and government purposes comes at the discounted price of $250. The same pricing and discount options go for Raptivity Essential lifetime licenses. The Raptivity Suite regular lifetime license can be purchased at $600 while the discount for education and government projects brings the price down to $500. While ReadyGo is not one of the fanciest HTML5 eLearning authoring tools, it does feature all the tools eLearning content developers need to work on their eLearning projects. eLearning content developers can combine various elements from different courses to develop new courses. With ReadyGo you can also easily import Adobe Dreamweaver files into your eLearning courses. RTF Conversion enables users to upload content of various types such as MS Word, Excel or Powerpoint files as well as HTML content and ReadyGo optimizes it for web playback. ReadyGo offers abundant customization features including different types of style sheets, frame layouts, fonts. Sidebar, title bar, services bar and the bullet page elements can also be customized and most features can be easily turned on or off. ReadyGo costs $499 and includes an initial support period of 3 months, training and product updates. If Ford gave a green light on SHIFT for its online training needs then they probably know something. SHIFT features a great responsive interface that plays seamlessly on any device and was awarded with the Silver Brandon Hall Excellence Award Technology 2014. SHIFT allows you to create realistic scenarios with its lip-synched human avatars. SHIFT’s responsive design ensures playback is perfect regardless of device. eLearning games are another integral part of SHIFT. It offers 15 eLearning game themes you can exploit to put together edifying eLearning game experiences for your online learners. With SHIFT you can customize your course as you see fit. Modify the background and the colors of your eLearning course pages with photos and colors from SHIFT’s library or upload your own ones. Also, if you’re tired of the same old eLearning evaluation activities then you’re in luck. SHIFT comes bearing great variety in eLearning evaluation templates. 80 different pre-built eLearning evaluation templates with various functionalities, styles, designs and colors to choose from. The basic pricing option is called Lite and you can purchase it for $120 per month or $1200 per year. The next plan up the ladder is called Power User and costs $350 per month or $3500 per year and offers unlimited number of courses as opposed to the 3 course limitation of the Lite plan. The last plan is Enterprise and can be purchased at $850 per month or in the form of an annual plan costing $8500. Enterprise has all the perks of the previous two, plus the ability for collaboration and the option to add extra users. Sleave is a cloud-based HTML5 eLearning authoring tool that’s multi-platform compatible, features multiple ways of making a page responsive and lets you create a page and preview how it comes out simultaneously. It also utilizes a highly optimized translation process and offers built-in content and quiz templates. Sleave allows eLearning content developers to create responsive designs planning for different levels of their creations such as the page, element or content level. Creating eLearning courses is sometimes synonymous to constant content changes. With Sleave you can make changes without having to publish your content. All eLearning professionals can verify how time-saving it is to have a solid template foundation to get you started on your eLearning project. Sleave has a large library of eLearning templates that can also be customized to your project’s needs. Sleave’s 4 step process enables course translation in various languages as well as the opportunity to embed language specific media assets on demand. The free plan is quite functional as it features SCORM 1.2, 2004 and AICC export and a maximum number of 5 projects to work on. The Developer pricing plan is offered at $100 per month or $1100 annually and features unlimited number of projects and pages per module. The Enterprise plan targets more advanced needs. For specific information on the Enterprise plan you will have to contact the company directly. An intuitive HTML5 eLearning authoring tool that enables eLearning content developers to personalize the online learners’ learning pathways and customize student instruction. It also provides rich learner analytics giving insight into student progress. Smart Sparrow has rich interactive components and HTML5 or Flash simulations that engage online learners. Adaptive Pathways is a feature that detects when an online learner is experiencing difficulty with a specific subject and provides them with extra material to get them jumpstarted. Feedback is an essential part of online training. Smart Sparrow’s Adaptive Feedback is an invaluable feature that evaluates the type of feedback the online learner needs and offers it at the right moment. Feedback forms vary from hints, videos, graphs or extra materials that are generated because an online learner remained on a specific screen for too long or asked a question. For limited needs there is a free version for use of up to 5 online learners. For more increased needs you can go with the pricing plan that offers coverage for up to 100 online learners. You can buy this plan for $15 per online learner. The second premium plan offers support for up to 500 online learners and is charged at $12 per online learner. The last premium plans covers needs for support of more than 500 online learners. If your needs are of that magnitude contact the company directly. Smartbuilder is an HTML5 eLearning authoring tool with a lot of great features such as an extensive Object Library, various templates, a functional Master Page, Smart Sets and a great Shared Content Library. The Object Library provides rich potential regarding variety and customization of features such as objects, videos, checkboxes, text, images and audio. Smartbuilder boasts great versatility in templates as well as the opportunity for eLearning content developers to create their own templates. The Master Page is the main page of the entire eLearning course. It can be fully customized with elements such as a menu, navigation buttons, glossary, help and volume control. Smart sets can help you group objects into sets that provide built-in sequencing, scoring and show/hide logic. The Shared Content Library allows project team members to access content easily and without the need for time-consuming communication. The standard package is called Community Edition and is entirely free of charge with no expiration. The Professional Edition runs at $1970. The domiKnow Platform is one of those HTML5 eLearning authoring tools that don't limit themselves to just authoring. Three different authoring modes to choose from as well as the ability to use it as a publishing platform. Mobile app also available.The domiKnow Platform is one of those HTML5 eLearning authoring tools that don't limit themselves to just authoring. Three different authoring modes to choose from as well as the ability to use it as a publishing platform. Mobile app also available. The domiKnow Platform utilizes a 3-mode authoring system. eLearning content developers can choose between Flow, Claro and Capture to suit their project needs. Project assets can be accessed by all members of a project enabling information re-purposing or reuse. Great project collaboration functions by use of built-in design and tracking features as well as the ability to co-author content and receive feedback from reviewers. Reviews are extremely easy to make by simply sending a link to the project and enabling reviewers to leave comments as well. For individual authors or small teams the basic package can be purchased at $167 per month and per author or $1,997 billed annually. For larger teams the Workgroup pricing option costs $208 per month for every author that uses the program or $2,497 billed annually. If you want to discuss pricing options for the 3rd plan called Enterprise you have to contact the company directly. TT Performance Suite can help you with all your online training needs from product skills all the way to soft skills. As an HTML5 eLearning authoring tool it supports smooth playback on all devices. Ready-made templates ensure all parts of your eLearning project maintain a consistent design and lets you focus on eLearning content. Smart Components is a feature that allows eLearning content developers to create fascinating and interactive eLearning content as well as eLearning games. TT Performance Suite provides support for SCORM as well as AICC eLearning content. This means that it’s compatible with most well-known Learning Management Systems. TT Performance Suite plays perfectly on any device. It can be accessed both online and offline via the Knowledge app. This HTML5 eLearning authoring tool showcases some pretty impressive statistics. 50% reduction in learning content creation, 70% reduction in instructor-led training, 30% reduction in time needed to become proficient at the subject taught, as well as payback within one year. uPerform is an HTML5 eLearning authoring tool that offers customized online training experiences and lots of other features. To fully cater to the client’s needs Ancile performs a needs analysis. This helps them establish what the client’s needs are and customize uPerform accordingly. Training for admins and developers allows for proper use of the authoring tool as well as unlocks its full potential to the clients. Vivo has some excellent features in terms of Voice and Movement, Customisation and Interaction. Vivo provides realistic simulations online learners can immerse in and apply the knowledge they have acquired. Vivo provides ready-made templates that can be further customized as well as output in both Flash and HTML5. Some great narration potential with this HTML5 eLearning authoring tool. Additionally, Vivo is one of the few authoring tools that allows you to move and change images once they have become part of your page. With most authoring tools you have to adapt your eLearning course to what your authoring tool can do, not the other way around. That’s not the case here. Vivo boasts great customization features that empower eLearning content developers to design completely customized eLearning courses. Starting price is at $150. For further information on specific pricing options contact them directly through their website. If you’re looking for a chance to create eLearning games, publish them and make money out of that then WiMi5 should be one of your go-to HTML5 eLearning authoring tools. Games for educational as well as entertainment purposes, customizable templates, how-to guides and technical documents comprise a comprehensive list of features of what this HTML5 eLearning authoring tool has to offer. WiMi5 features a great number of how-to guides ranging from how to integrate a game in your website or an LMS all the way to how to publish your HTML5 game on the Google Chrome Web Store. Video tutorials give you a good idea of how to deal with basic elements of game creation. WiMi5’s video tutorials cover everything from scene design, scripts and levels to publication. Using WiMi5 you can find a good number of templates covering many well-known games such as Memory Cards, Matching, Hangman, Sequences, Quiz, and Word Search. Technical Documentation includes information on Programming Code, Devices, Game Session Storage, Labels, Parameters Management as well as Rankings. Starting price is at $5. For further information on specific pricing options contact them directly through their website. Zenler provides tools and features for all the stages of an eLearning course, from development and deployment to selling your course online. Zenler Studio is Zenler’s HTML5 eLearning authoring tool which helps you create eLearning courses right from the comfort of your MS Powerpoint environment. The Course Wizard guides you every step of the way towards structuring your eLearning course appropriately, including course elements such as chapters, quizzes and course styles. Zenler Studio showcases some great interactivity potential with its fancy effects such as eBook, 3D Cube, Panoramic Zoom and 3D Wall Effects. Zenler Studio’s Scenario Builder offers eLearning content developers great possibilities for creating versatile eLearning scenarios across a wide range of topics. Scenario editing can also be easily achieved including the ability to add avatars or change scenes. The built-in screen recording tool eliminates the need for third-party screen recording applications. You can also include already existing audio or video files as narrations or record new ones with the Zenler Studio’s recording tool. Zenler Studio Pro is the basic plan and costs $299 but does not support HTML5, iOS, Android or SCORM. For that you have to pay for the Zenler Studio Pro Plus which you can buy for $699. HTML5 eLearning authoring tools are here to stay. Mobile device use is on the rise nowadays, which has made Flash-based applications in eLearning almost obsolete. Online learners need access to their eLearning courses from any place and at any time. 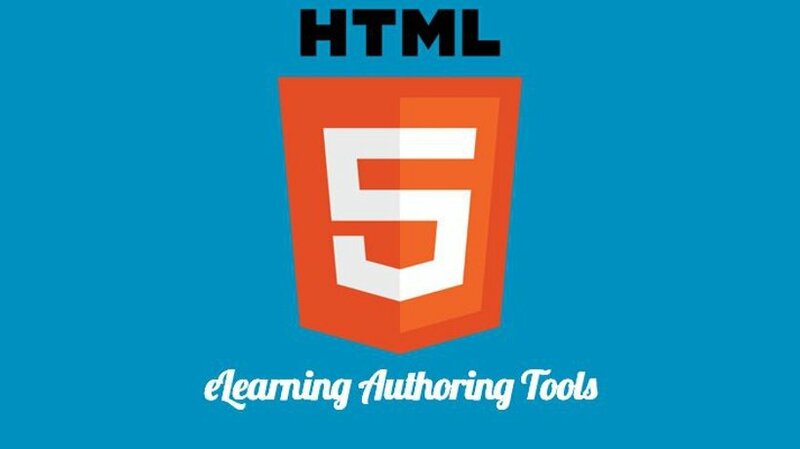 This was an informative list of HTML5 eLearning authoring tools that showcases all the features each authoring tool has to offer. If you are in the market for an HTML5 eLearning authoring tool this list can help you pick the one that suits your needs. If you have been already using a specific HTML5 eLearning authoring tool or have a preference for one submit a review in our HTML5 eLearning Authoring Tools Directory. Also, don't forget to create a free listing in our Top eLearning Authoring Tools Directory. The process is quite simple and won't take more than 3 minutes of your time.